Seaver lists Susan as a daughter of Hubert V.C. Holcombe; however, the birthdates indicate she is a sibling and McPherson lists her as such. Susan Mills Holcombe was born on 28 November 1834. She was the daughter of Dr. Vincent W. Holcombe and Susannah Mills. Susan Mills Holcombe married Albert Hull, son of George Hull Lt. Gov., on 28 November 1862. [S25] Hannah McPherson, Holcombe Genealogy, Page 133.1/Item A-8-1-2-9-4-1-6. Eunice Anise Squires was born circa 1829 at CT.1 She married Hubert Vincent Clairbone Holcombe, son of Dr. Vincent W. Holcombe and Susannah Mills, on 16 August 1852. Mary Jane Hill was born circa 1839 at CT.1 She married Hubert Vincent Clairbone Holcombe, son of Dr. Vincent W. Holcombe and Susannah Mills, on 6 September 1865. Clifford Heebner Holcombe was born on 6 October 1866. He was the son of Charles Clifford Holcombe and Agnes Whiton Brown. Albert Hull was the son of George Hull Lt. Gov. Albert Hull married Susan Mills Holcombe, daughter of Dr. Vincent W. Holcombe and Susannah Mills, on 28 November 1862. Elizabeth Hull was born on 4 November 1863 at New Boston, MA. She was the daughter of Albert Hull and Susan Mills Holcombe. [S25] Hannah McPherson, Holcombe Genealogy, Page 133.1/Item A-8-1-2-9-4-1-6-1. Child of George Hull Lt. Gov. Eunice Ormsby was born on 4 May 1809 at NY. She married Horace Holcombe, son of Alvin T. Holcombe and Mary Mather. Eunice Ormsby died on 26 April 1885 at age 75. She was buried at New Ohio Cemetery, North Colesville, Broome Co., NY. Mary Holcombe was born circa 1827 at NY.1 She was the daughter of Horace Holcombe and Eunice Ormsby. 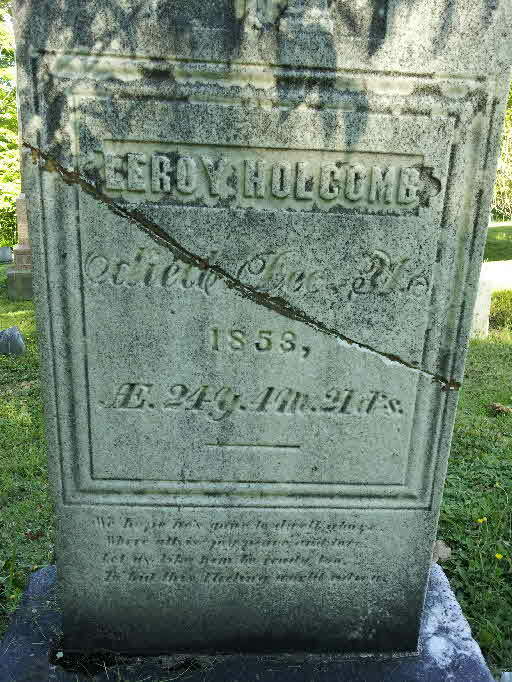 Leroy Holcombe was born circa August 1829 at NY.1 He was the son of Horace Holcombe and Eunice Ormsby. Leroy Holcombe died on 31 December 1853. He was buried at New Ohio Cemetery, North Colesville, Broome Co., NY. Sarah (Sally) M. Holcombe was born circa 1830 at NY.1 She was the daughter of Horace Holcombe and Eunice Ormsby. Julia A. Holcombe was born in 1834 at NY. She was the daughter of Horace Holcombe and Eunice Ormsby. Gilbert Holcombe was born in 1837 at NY. He was the son of Horace Holcombe and Eunice Ormsby. William H. Holcombe was born on 30 September 1838 at NY. He was the son of Horace Holcombe and Eunice Ormsby. William H. Holcombe married Theresa Ward in 1858. William H. Holcombe died on 23 June 1869 at age 30. He was buried at New Ohio Cemetery, North Colesville, Broome Co., NY. William H. and Theresa were enumerated in the 1865 Colesville, Broome Co., NY state census. He was 25 she was 27. Children in the household were William R. 6, Eunice R. 4, and Albert E. 2 years 10 months. Lucy Holcombe was born in 1841 at NY. She was the daughter of Horace Holcombe and Eunice Ormsby. Emily Holcombe was born in 1844 at NY. She was the daughter of Horace Holcombe and Eunice Ormsby. Alvin Holcombe was born on 10 October 1804 at Granville, Hampden Co., MA. He was the son of Alvin T. Holcombe and Mary Mather. Alvin Holcombe married Lucy Watrous, daughter of David Watrous and Patty Church, on 10 May 1828. Alvin Holcombe married Sally Ann Watrous, daughter of David Watrous and Patty Church, on 23 August 1841 at NY. 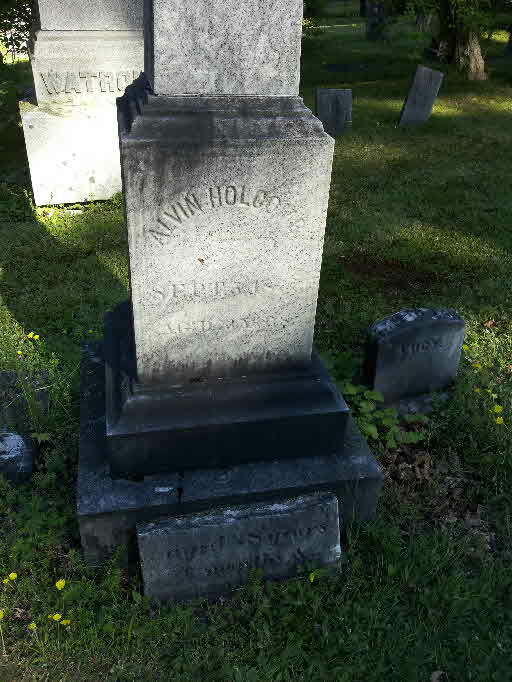 Alvin Holcombe died on 3 September 1877 at North Colesville, Broome Co., NY, at age 72. He was buried at New Ohio Cemetery, North Colesville, Broome Co., NY. Alvin is recorded in the 1850 Colesville, Broome Co., NY, federal census, page 36, with extended family as a farmer. He was 45, she was 35. Father Alvin T. was 81, brother Lewis was 39, daughter Lucy L. 18, Elizabeth 15, George 12, Milo 6, Daniel 4, Albert 3. Alvin and Sally were enumerated in the 1860 Colesville, Broome Co., NY, federal census, page 26. He was a farmer, age 55; she was 44. Children in the household were George 22, Milo 16, David 14, Olive 4, and Mother-in-law Patty Watrous, 62. Alvin and Sally A. were enumerated in the 1870 Colesville, Broome Co., NY, federal census, page 33. He was a farmer age 66, she was 55. Children in the household were Milo 25, Amelia 18, David 23, and Olive 14. Additional information on Alvin and his descendants is in a letter from Steven Watrous, Springville, Utah. He cites extensive census records and correspondence. [S25] Hannah McPherson, Holcombe Genealogy, Page 133.2/Item A-8-1-2-9-4-3. Lucy Watrous was born on 11 July 1811 at Granby, Hartford Co., CT. She was the daughter of David Watrous and Patty Church. Lucy Watrous married Alvin Holcombe, son of Alvin T. Holcombe and Mary Mather, on 10 May 1828. 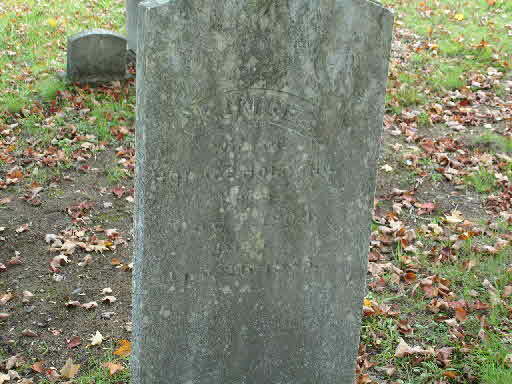 Lucy Watrous died on 31 January 1840 at Colesville, Broome Co., NY, at age 28. She was buried at New Ohio Cemetery, North Colesville, Broome Co., NY. David Watrous was born in 1784 at CT. He married Patty Church. Sally Ann Watrous was born on 11 November 1815 at Hartland, Hartford Co., CT. She was the daughter of David Watrous and Patty Church. Sally Ann Watrous married Alvin Holcombe, son of Alvin T. Holcombe and Mary Mather, on 23 August 1841 at NY. 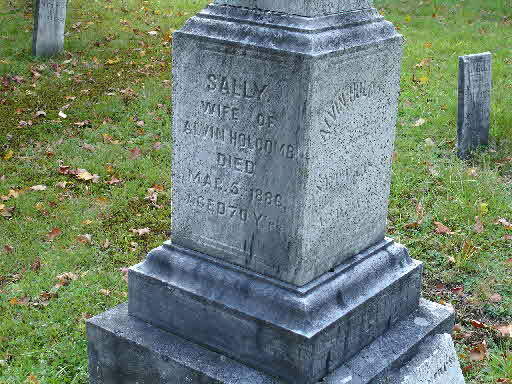 Sally Ann Watrous died on 5 March 1886 at Colesville, Broome Co., NY, at age 70. She was buried at New Ohio Cemetery, North Colesville, Broome Co., NY. Violet Holcombe was born on 22 September 1830 at NY.1 She was the daughter of Alvin Holcombe and Lucy Watrous. Violet Holcombe died in 1906. Additional information on Violet and her descendants is in a letter from Steven Watrous, Springville, Utah. He cites extensive census records and correspondence. Violet and Olias were enumerated in the 1860 Colesville, Broome Co., NY, federal census, page 26, next door to her parents. Olias was a farmer, age 37; she was 28. Children in the household were Ella 7, Clifton 5, Hubert 3, and Caroline, 8/12. Lydia A. Holcombe was born on 2 July 1833. She was the daughter of Alvin Holcombe and Lucy Watrous. 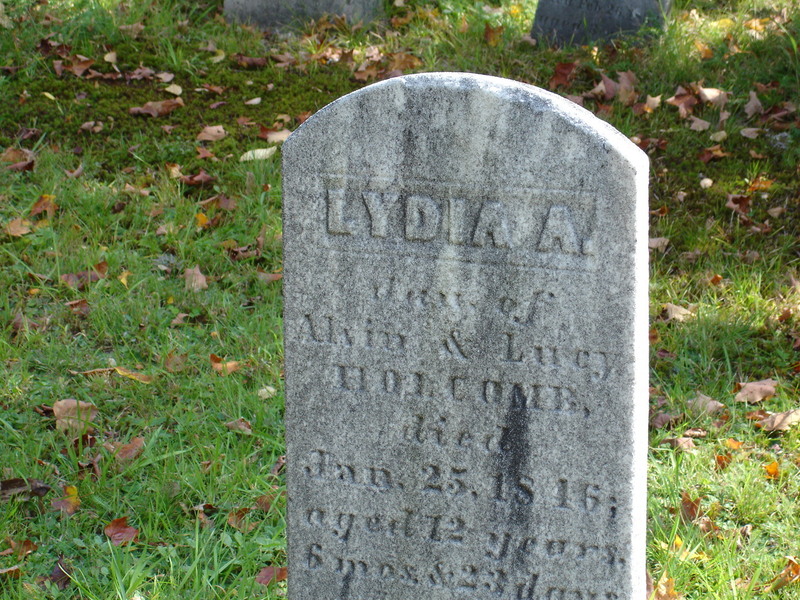 Lydia A. Holcombe died on 25 January 1846 at Colesville, Broome Co., NY, at age 12. She was buried at New Ohio Cemetery, North Colesville, Broome Co., NY. Elizabeth M. Holcombe was born on 28 April 1834 at Colesville, Broome Co., NY. She was the daughter of Alvin Holcombe and Lucy Watrous. Elizabeth M. Holcombe married Egbert A. Baker in 1856. Elizabeth M. Holcombe died on 18 March 1886 at age 51. She was buried at New Ohio Cemetery, North Colesville, Broome Co., NY. Additional information on Elizabeth and her descendants is in a letter from Steven Watrous, Springville, Utah. He cites extensive census records and correspondence. Egbert A. Baker was born on 24 August 1837. He married Elizabeth M. Holcombe, daughter of Alvin Holcombe and Lucy Watrous, in 1856. 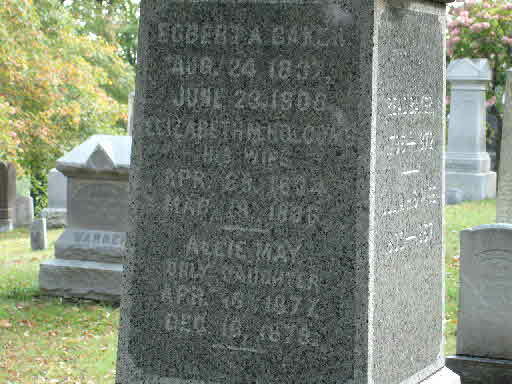 Egbert A. Baker died on 23 June 1908 at age 70. He was buried at New Ohio Cemetery, North Colesville, Broome Co., NY. George A. Holcombe was born on 6 October 1837 at Colesville, Broome Co., NY.1 He was the son of Alvin Holcombe and Lucy Watrous. George A. Holcombe married Eunice Ann Warner, daughter of John Warner and Deborah Miller, in 1861. George A. Holcombe died in 1917. He was buried at New Ohio Cemetery, North Colesville, Broome Co., NY. Additional information on George and his descendants is in a letter from Steven Watrous, Springville, Utah. He cites extensive census records and correspondence. George and Eunice were enumeated in the 1900 Colesville, Broome Co., NY, federal census. He was a farmer age 61, she was 59 and they had been married 39 years. Children in the household were Abbie D. 24, Alvin J. 21, and Mary 11. Daughter Nancy was not enumerated here. She may have already been living with her sister, Estelle, where she died in 1904. Eunice Ann Warner was born in August 1841 at NY.1 She was the daughter of John Warner and Deborah Miller. Eunice Ann Warner married George A. Holcombe, son of Alvin Holcombe and Lucy Watrous, in 1861. Eunice Ann Warner died in 1904. She was buried at New Ohio Cemetery, North Colesville, Broome Co., NY. Estelle Holcombe was born in 1869. 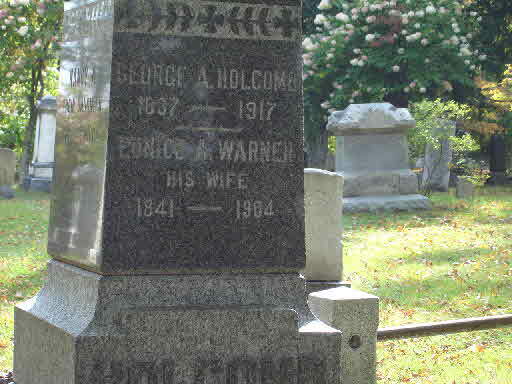 She was the daughter of George A. Holcombe and Eunice Ann Warner. Myron Holcombe was born on 31 October 1841 at Colesville, Broome Co., NY. He was the son of Alvin Holcombe and Sally Ann Watrous. 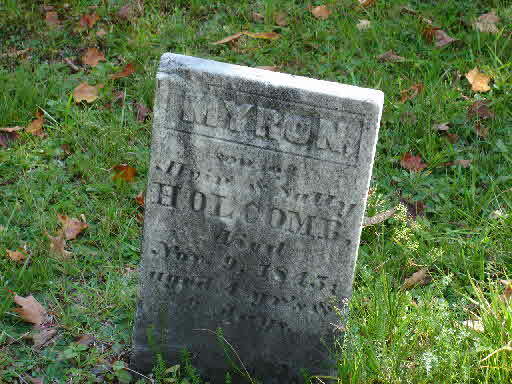 Myron Holcombe died on 9 November 1845 at Colesville, Broome Co., NY, at age 4. He was buried at New Ohio Cemetery, North Colesville, Broome Co., NY. Milo Holcombe was born on 28 January 1844 at Colesville, Broome Co., NY. He was the son of Alvin Holcombe and Sally Ann Watrous. Milo Holcombe married Amelia Manville in 1869. Additional information on Milo and his descendants is in a letter from Steven Watrous, Springville, Utah. He cites extensive census records and correspondence. Amelia Manville married Milo Holcombe, son of Alvin Holcombe and Sally Ann Watrous, in 1869. David W. Holcombe was born on 18 September 1845 at Colesville, Broome Co., NY. He was the son of Alvin Holcombe and Sally Ann Watrous. David W. Holcombe married Liveria Dyer, daughter of Charels Dyer and Phebe Sherwood, in 1874. 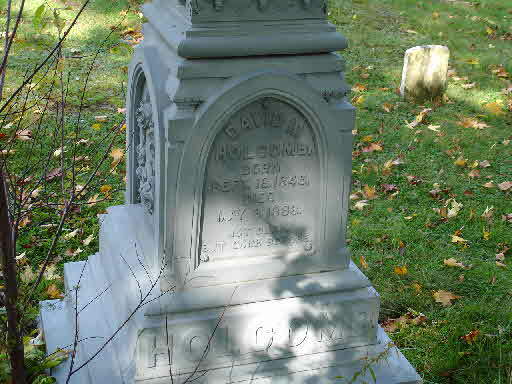 David W. Holcombe died on 3 May 1888 at age 42. He was buried at New Ohio Cemetery, North Colesville, Broome Co., NY. Birth and death dates are from Seaver. Steven Watrous, Springville, Utah, suggests that Albert was born in 1847 and died 1861, based on the gravestone inscription, but cautions that, it could have been misread because the 1855 State census and 1860 US census do not show him in the household. Albert H. Holcombe was born on 11 April 1848 at NY. He was the son of Alvin Holcombe and Sally Ann Watrous. 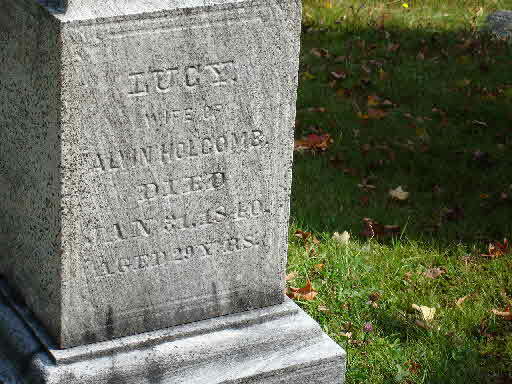 Albert H. Holcombe died on 7 April 1859 at Colesville, Broome Co., NY, at age 10. He was buried at North Colesville, Broome Co., NY. Olive Alice Holcombe was born on 23 May 1856 at Broome Co., NY. She was the daughter of Alvin Holcombe and Sally Ann Watrous. Olive Alice Holcombe married Edgar Hicks in 1877. Olive Alice Holcombe died on 15 May 1926 at Binghamton, Broome Co., NY, at age 69. Edgar and Olive were enumerated in the 1910 Kikrwood, Broome Co., NY, federal census. He was a farmer age 54, she was 53. They had had no children of their own but the household had two adopted children, Samuel Watrous and Hannah Banner, and Hannah's husband Lyman Banner. Richard Holcombe was born on 7 July 1810 at Granville, Hampden Co., MA. He was the son of Alvin T. Holcombe and Mary Mather. Richard Holcombe died on 15 May 1814 at age 3. Asa Holcombe was born on 20 July 1804 at Granby, Hartford Co., CT.2 He was the son of Asa Holcombe and Lucinda Miller. Asa Holcombe married Fanny Orcutt, daughter of (?) Orcutt, on 26 February 1833. Asa III moved from near Lake Champlain in NY about 1835 to Rundell Springs Twp., Crawford Co., PA where he is recorded as farmer with family in the 1850 census. Asa and Fanny were enumerated in the 1860 Spring Twp., Crawford Co., PA, federal census. He was a farmer age 50, she was 45. Children in the household were Sophronia 16, Viola 13, Lura 8, Eva 6, Ella 4, Hiram 21, Orson 11; father Asa age 82 was also in the household. Asa and Fanny were enumerated in the 1870 Corneautville, Spring Twp. Crawford Co., PA, federal census. He was a farmer, age 65, she was 56. There were enumerated near his brother Luman and his son John. Also enumerated in the household was Mr. Farr and his wife Sophronia, apparently their daughter and her husband. Also enumerated next door was Amos Proctor and his wife Almira 21, born in PA, probably another daughter. has accumulated 150 acres of land by hard work and economy on the part of both himself and wife. In politics he is a strong Republican. [S25] Hannah McPherson, Holcombe Genealogy, Page 133.2/Item A-8-1-2-9-5-2. Lewis moved with his parents from Connecticut to Washington Co., NY. In about 1829 he moved with his family to Crawford Co., PA 3. Lewis and Wealthana were enumerated in the 1850 Conneautville, Crawford Co., PA, federal census, dwelling 120, family 126. He was a farmer, age 45, born in CT; she was 43, born in NY. Children in the household were Amos 25 a boatman, Polly A. 23, Asa 21, Phylura 18, Adelia 16, Wealthanna (actually name illegible) 14, Caroline 11, Lewis 8, Emily J. 6, and Oliver 5/12. [S406] Beulah Warner Russon, Banyan Tree, Page 11. [S406] Beulah Warner Russon, Banyan Tree, Page 75. [S406] Beulah Warner Russon, Banyan Tree, Page 76. Luman Holcombe was born circa 1810 at NY.3 He was the son of Asa Holcombe and Lucinda Miller. Luman Holcombe married Achsah Sanders. Luman moved from near Lake Champlain in NY to Rundell Springs Twp., Crawford Co., PA about 1835 with his brothers Asa and William, where he owned a farm on which he lived until his death. He is recorded as farmer, with family in 1850 census of Rundell. Luman and A. D. were enumerated in the 1870 Cormeantville, Spring Twp., Crawford Co., PA, federal census. He was a farmer age 60, she was 54. The only child in the household was O. H. 18. Son JJ was enumerated next door, and brother Asa was next to him. [S25] Hannah McPherson, Holcombe Genealogy, Page 133.2/Item A-8-1-2-9-5-4. Billie Holcombe (bholcomb @ holjeron.com) is filling in the details on descendants of William. The source of this information is the 1850 and 1860 census of PA from Betty Kovac, and Annette Lynch at the Crawford County Genealogical Society. William and Sarah were enumerated in the 1860 Conneautville, Conneaut Twp., Crawford Co., PA, federal census. He was a farmer, age 32, she was 24. Children in the household were Emalissa 5, Ida J. 4, William H. 3, and Theodore 6 months. [S179] James Pickering, Flora Bronson White Justin Leiber, "unknown short article title." [S810] Edwin W. Strickland II, William Buell, 1-8, page 304. Almira Holcombe was born at NY.1 She was the daughter of Asa Holcombe and Lucinda Miller. Last name is based on a story by Flora Holcombe Bronson. Fanny Orcutt was born circa 1816 at MA. She was the daughter of (?) Orcutt. Fanny Orcutt married Asa Holcombe, son of Asa Holcombe and Lucinda Miller, on 26 February 1833. Lucinda Holcombe was born circa 1833 at NY.1 She was the daughter of Asa Holcombe and Fanny Orcutt. Almedia Holcombe married J. Wood. 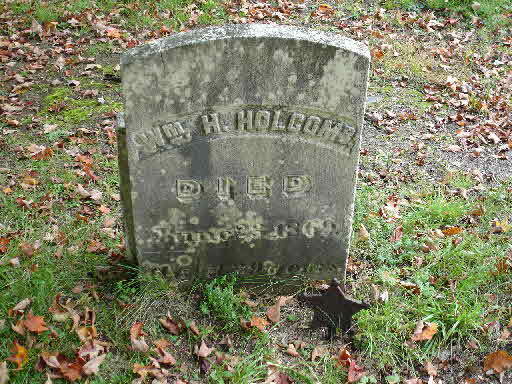 Almedia Holcombe was born circa 1835 at NY.1 She was the daughter of Asa Holcombe and Fanny Orcutt. Herman Holcombe was born circa 1837 at PA.1 He was the son of Asa Holcombe and Fanny Orcutt.